Story: I won't go into all the excuses for not writing the 50th post for so long... just want to thank you for waiting patiently! I hope the post is worth the wait. 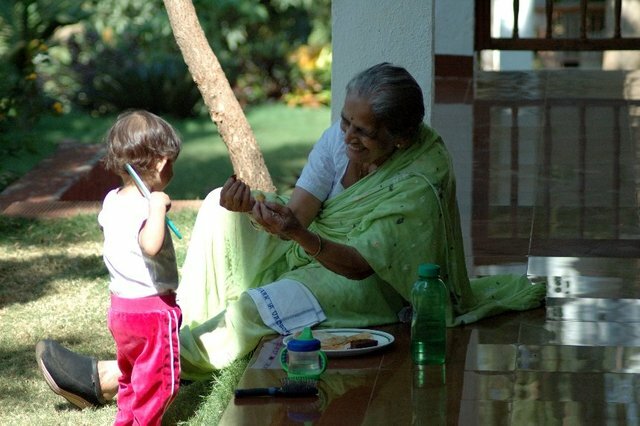 This special post is about a special person whom I admire for so many reasons.. my Aaji! My Aaji/Grandma is super cool.. always has been. I don't know of any other Aaji that has her own music system set up with a headphone! Aaji has and uses her sunglasses when she is going out on a hot summer day.. She is the managing trusty of a social service organization for women. She is 87 and has the enthusiasm of a 10 year old.. Needless to say... Aaji also satisfies the prerequisite of being a Grandma... she is an amazing cook! Few months ago Aaji sent a bottle of home made hot & sweet lemon pickle with one of my cousins. Shank loves this lemon pickle.. but this time.. the taste was something more than the usual. I cannot really describe it.. but it was simply perfect! Next time I was talking to Aaji over the phone I told her that we are crazy about the new lemon pickle. Here's what my Aaji said - "I was talking to Pushpa and she told me about this new recipe for the lemon pickle. I will write down the recipe for you in my next letter..." in Marathi - "Aga - Pushpa mala mhanali ki eka navin paddhaticha lonacha shikale aahe. Tar mi mhanala ki apanahi tichyakadun shikun ghyayala kay harkat aahe? Tula patrani pathavate"
The next letter from Aaji came with another bottle of the pickle and the recipe as well. 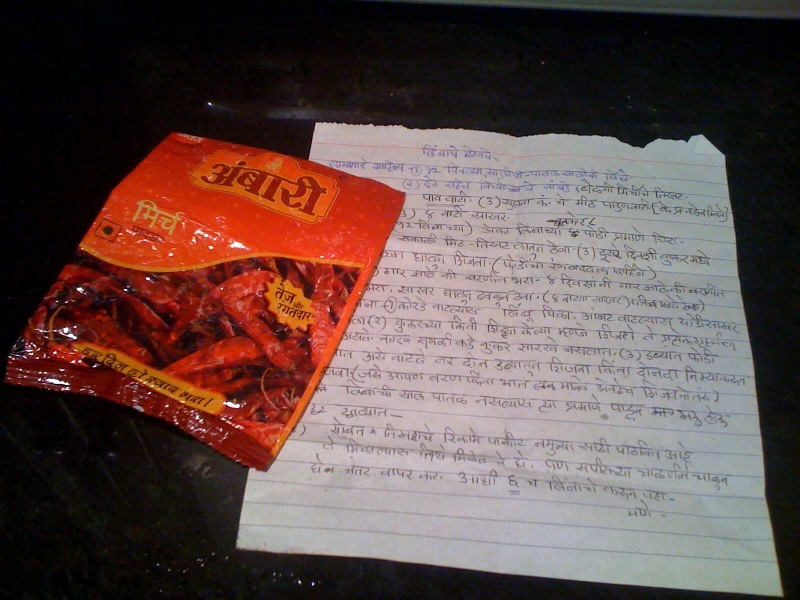 She is so cute - she sent me the empty packet of the specific brand red chilly powder. Just so I can buy the exact same brand here! Aaji - tussi great ho! BTW - this is the first recipe on my blog that I have tasted - but have not tried! and guess what - I am way more confident about the quality of this recipe than any previous recipe. The recipe in Aaji's handwriting and and the empty packet..
Cut each lemon into 8 pieces. Rub salt and chilly powder on the lemon pieces and keep covered for one whole day. The next day cook these lemon pieces in a pressure cooker till the pieces are half cooked. Take the mixture out of the pressure cooker and keep aside till it completely cools down. Once it is cooled, pour this mixture in a bottle. Add Sugar to the mixture and stir well. Keep refrigerated. Tips: If you want to increase the sour taste - add extra lemon juice. Make sure that the pressure cooker is not overloaded with lemon pieces. It may be better to cook the lemon pieces in two batches. Congratulations on the 50th post. Hope you keep writing with the same enthusiasm. It has been fun reading them since Day 1. Any chances your Aaji will get to read this post? thank you Shanu! I am hoping I can keep up with my once a week schedule..